Learning Success – Review and Competition. The Learning Success System is a simple method parents can use to help children overcome learning difficulties. It simplifies the process and enables a parent to work at home with their child. The Learning Success System is convenient for both children and parents. It minimises high costs of learning centres. It uses cutting edge neuroscience research. The site offers a learning difficulty analysis which is really useful. You could discover that it’s just one micro-skill that your child needs to make learning easier. Dysgraphia. It’s also helpful for children who just find learning difficult. they may be struggling with a specific problem, or falling behind their class mates. On starting learning success you are introduced to the Key Tenets, or the philosophy of learning success. It’s very detailed and includes such things as micro skill, grit, emotions, nutrition and multi-sensory approaches. The program is customisable to your needs but the suggestions are that you start out with some exercise for your child. There is a short video which explains why this is important. It’s something that is being realised a lot more these days, even my kid’s school are experimenting with an little exercise before learning. Then you need to do a cross-lateral exercise and a micro skill exercise. These exercises are explained in detail as you work through the process and you can choose which ones to do with your child. As you continue with the course you add more micro-skills until you are doing enough to fulfil your allotted time commitment. You decide at the beginning how much time you are going to spend each day following Learning Success. You are also asked to journal the learning Success journey. This keeps you on track and focused. I spent a little time with my child each day recording what we had done. You will soon develop a routine but it’s good to break it up once in a while, play a game or listen to an audio book. We are learning Spanish by reading and listening to audio books. We do this activity once a week, it’s different and fun. I love that the rules are not set in stone because everyone is different. You make your commitment which suits you and your child, this can be 15 minutes a day, 3 times a week, 15 minutes a day, 5 times a week, or 30 minutes twice a week…you get the idea. Commit to something you know you can do. Each day you will receive an e-mail with a link to the day’s exercise(s) There are little videos each day which don’t take up much time. The content is varied and interesting for both parent and child. You can access all of the lessons all of the time in your member area. This is why it is so customisable. I have found the Learning Success system easy to use and very helpful. It’s nothing like any learning system I’ve seen before. There are also forums for you to connect with other parents and ask questions or share your experiences. The Learning Success Blog is filled with brilliant posts about learning difficulties and ways of looking at them which are probably very different to ways that have been looked at before. Would you like to try Learning Success for yourself? I’ve been given one account to give to one of my readers and all you have to do is fill in the rafflecopter widget. Please read Terms and Conditions below. Disclosure: Learning Success allowed me access to an account in return for my review and competition. All opinions formed are my own. Chipex Touch Up Paint – Review and Competition. I had a new car last September, I was the only driver in the house and the car was a life saver making travelling so much easier. Yes, before that I was one of those annoying disabled wheelchair users taking up space on the bus. In January, Graham, my husband, passed his driving test and I was so grateful because driving was becoming so difficult for me. He is such a good driver, with no nervousness at all he has taken to it so well. I was a little worried as I know most people have car accidents when they are a new driver. I know I did, I hit a post in a car park, went into the back of someone at a junction, and had a rather nasty accident when I hit the side of a car that was turning. Since the first year I’ve not had another accident and I’ve been driving nearly twenty years now. Graham took the car one day to visit his mum and pop into the supermarket to pick up some shopping for me. While he was in the supermarket someone managed to scratch the car on the back wheel arch. Graham was fuming and so was I, our lovely car was now sporting an ugly scratch. We were now faced with two options, pay for an expensive repair or buy one of those paint sticks you can get from the auto shop. We couldn’t really afford option one so we had a look at the paint in the shops and couldn’t find and exact match for our colour. Then Chipex came to the rescue with one of their colour match paint system. 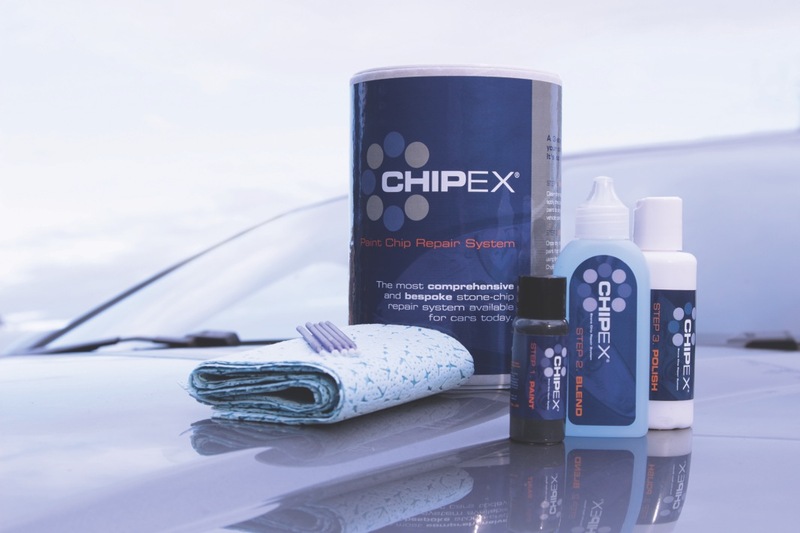 Chipex offer a kit which treats stone chips and scratches, it contains all you need to make your car look like new again. Take a look at this little video to see how it works. You can find your exact car colour by entering your registration number or looking up your car colour in a chart. Any problems just call them and ask. We found our colour pretty quickly and soon ordered the correct package. The instructions are easy to follow but you may need to practice the application on a small area first. Some deeper scratches may need more than one application. Our car had a particularly nasty deep scratch that my husband had to paint three times. It really is a simple as 1, 2, 3 easy steps to get your car looking good again. My husband said that the instructions were very well explained, and it was all easy to use. He was really pleased with the results. There were couple of things he would change though. The paint brushes could have been provided in different sizes as not all scratches are the same. Also, he said that the blending in block provided could have been a bit bigger. This is all bearing in mind that our scratch was pretty big. So, what did it look like after treatment? As you can see, it looks much better! How would you like to win a Chipex bundle for your car? It doesn’t matter if you don’t have a scratch you can always get one for those just in case moments. Fill in the widget below for your chance to win a £64 bundle including screenwash. Open to anyone living in the UK. Ends on 20th April 2017. I love Easter! To prove it I’m going to give you the opportunity to win a fabulous Cadbury Dairy Milk Giant Easter Egg! First let me introduce you to some of the Fabulous Easter Gifts you can buy direct from Cadburys Gift Shop online. Easter Egg Hunts are always loads of fun, so why not have one with this Easter Treasure Box for £10. How about a fun Easter treat for the little ones with this Buttons Eggs Gift Set for £18. There are other large eggs available in this two for £15 offer. 2 x Large 271g Cadbury Roses Easter Egg. Each Egg box has one large egg and one bag of Roses. Looking for something a bit more Manly, how about this Cadbury Dairy Milk Egg with a Gorilla (From the ads) £15…or you can get a bigger version on the website. 1 x 331g Cadbury Dairy Milk Egg includes three bars of Cadbury Dairy Milk, 1 x Cadbury Gorilla Medium Soft Toy (suitable from 3 months upwards). Cadburys gift shop has lots to choose from with prices starting at £1.49 for this Easter Bunny. 1 x 50g Cadbury Dairy Milk Hollow Milk Chocolate Easter Bunny. Now for the Give Away, How would you like to win this Cadbury Dairy Milk Giant Egg (515g) which retails at £9.99? The competition closes on 8th April which means a week before Easter. I cannot guarantee the prize will arrive in time but depending on the time of reply from the winner it should be possible. All you have to do is visit the Cadbury Gift Store and tell me which Easter Gift you’d most like to receive in the comments of this post. Fill in the rafflecopter widget for more entries. See Rules after widget please. 11. There is no guarantee that this prize will be sent out in time for Easter . Let’s face it, kids get through a lot of shoes don’t they? They grow so quickly, or ruin them in the playground. An extra pair is always a big bonus so please read on to find out how you can win a voucher to spend at See Kai Run Footwear from Diapers. com. My girls love their shoes, they have sandles, heels, trainers, pumps, ballet shoes and school shoes. The Little Man is nearly as bad as he has shoes, trainers, pumps and school shoes. I was looking at the See Kai Run site and I think my Little Man would love these. They are so cute and would be lovely to run around in the summer with. I love the grey denim with the colourful strips. He could wear them while we were on holiday, we are really looking forward to going away this year and have a break booked up at Haven Holiday Park in Weymouth. I’d team them with some joggers and a cute summer t-shirt. Buying shoes for kids can be a bit of a minefield though, how do you know you are getting the right size? Which sort should you opt for? Is a bargain shoe as good as a brand name shoe? For babies: bare feet or socks are best, it’s easier for them to learn to walk, but do keep those little feet covered up if you go outside to protect them from the elements. For toddlers: Once your child begins walking then you have to think about protecting their feet but remember that feet grow quickly at this age so whatever you buy won’t last that long, it might be an idea not to spend too much. Preschoolers: Now your child will be running around and giving those shoes a real good battering so you will want something more durable and because the growth has slowed down a little you might want to invest more in their shoes. Here is a more detailed article on how to buy shoes for your child if you wish to know more. This video shows what it’s like taking your child to a shoe shop to get the right size shoes for them. I have always found the first real shoe shop a really exciting time, it’s the transition from baby to toddler. When my children were young it was my Mother who liked to take them for their first walking shoes and in some shops they will make a big deal of it too, including a photo of your child in their brand new shoes. Now on to the giveaway. You can win a voucher card to the value of $50 to spend site wide at Diapers. com including the lovely See Kai Run Footwear. This competition is open internationally and the site delivers worldwide. Just fill in the widget below but don’t forget to leave your comment on this post. Please read the Terms and Conditions below the widget. 10. As an International entry competition, the prize winner may be liable for postage fees and custom fees for their prize.